The Blendtec® Total Blender utilizes the same cutting-edge technology and powerful motor used in restaurants, coffee houses, and smoothie shops around the world. 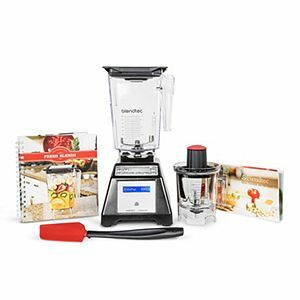 The Blendtec® Total Blender comes with microprocessor controlled electronics that boast 6 pre-programmed blend cycles. At the touch of a button the blender can make fresh whole juice, delicious smoothies, freezing cold ice cream, and it can even make steaming hot soup in under 90 seconds! The Total Blender knows when to speed up and slow down to get a perfectly consistent blend every time. The patented jar design can reach blade tip speeds of up to 320 M.P.H., providing more than enough power to easily turn ice into snow in seconds. The Blendtec® Total Blender comes with a large capacity WildSide® jar, perfect for a variety of blending needs. It also includes a Mini-Twister jar that is optimized for smaller servings and is great for making nut butters, baby food, sauces, hummus, and hard serve ice cream. You can now own the power of a professional, restaurant quality blender in your home with the Blendtec® Total Blender. Motor Base Weight: 5.6 lbs. WildSide Jar Weight: 1.6 lbs. Mini-Twister Jar Weight: 1.0 lb.